In the summer of 1787 the states met once again to revise the Articles of Confederation. 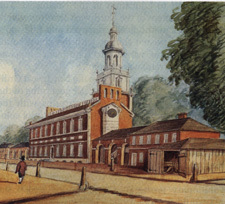 The Founding Fathers left Philadelphia with a brand new government in hand, the federal Constitution of 1787. Rather than a loose confederation of states, the Constitution created a joining of the states under a powerful central government and a strong executive. Ratified in 1788, the Constitution stands as today's longest-lasting government.